About 6 years old now, he has been waiting for a home for over 5 years!!! 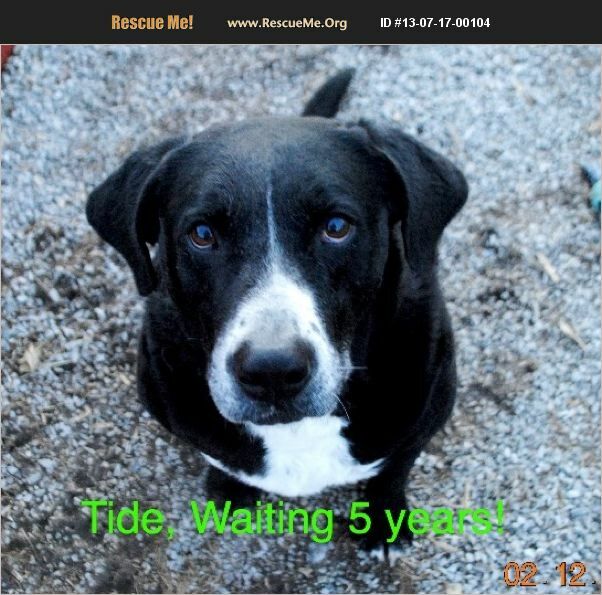 Tide is a very handsome boy, weighs about 70 pounds, a very solid, fun loving, lovable, dog. When crated he is perfectly well behaved, quiet and calm. He loves to sniff about and seemed to have potential for a search and rescue dog, or something to use his skills to advantage but now that he is older that opportunity has probably passed. He is a very confident dog and loves to hop in the car, or go anywhere you want to go which would be perfect for a working dog, or a buddy in a truck. Or he can wait at home, as long as this poor boy has been waiting getting attention before and after work is way more then he has had. He is crate trained, never potties in the crate, or kennel. He was rescued from a very high kill shelter in AL, where many dogs never make it out. I seen his face and just didnt want him cut short when he was a pup with SO much potential! He will play with another big dog, but he doesn't like all dogs. His favorite thing other then getting pet is playing, or to flop over on his back so you can rub his belly! He wants to meet anyone who has visited and so many people have been very impressed with how handsome he is, but they were wanting a small dog, or they have a cat. He is not good with cats. He will sometimes bark at children if they are running back and forth and teasing the dogs. Good only with older kids. He has always been fine with my young grandchildren. We havent worked with him much at all but he does learn fast, knows sit and down! He is built solid and acts very much like a lab. Contract and vet clinic phone number you use to call for a reference prior to adopting required.